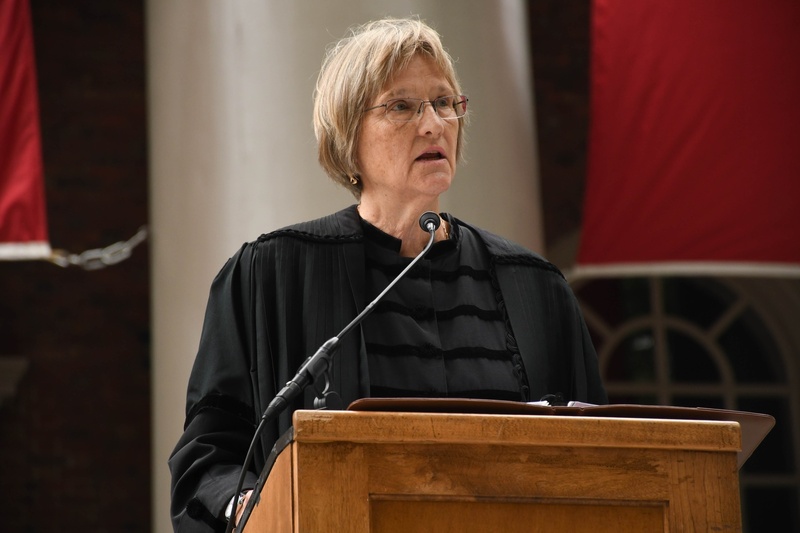 UPDATED: April 17, 2018 at 12:03 a.m.
University President Drew G. Faust called the forcible arrest of a black undergraduate by the Cambridge Police Department Friday night “profoundly disturbing” in an email sent to University affiliates Monday. 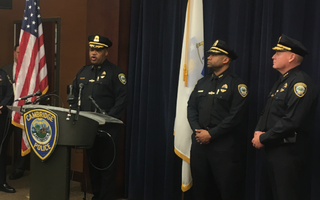 CPD officers arrested a College student Friday at the Corner of Massachusetts Avenue and Waterhouse St. after tackling the undergraduate to the ground. Officers tackled the student, who was naked, after determining the undergraduate had previously taken narcotics. CPD officers later wrote in a police report they tackled the student because he was making aggressive movements toward law enforcement. 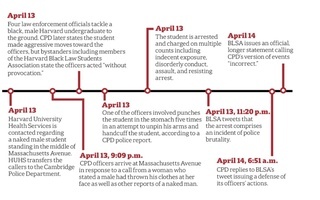 But members of the Harvard Black Law Students Association who witnessed the event have called CPD’s version of events “incorrect” and have said the officers tackled the student without provocation. While on the ground, at least one CPD officer punched the student in the stomach five times in an attempt to unpin the student’s arms and handcuff the undergraduate, according to the CPD police report. Faust wrote in her email that the University does “not yet know all the facts” and cannot fully understand what occurred until “the necessary reviews have been completed.” CPD is undertaking an internal review of the incident given use of force was involved; internal reviews are mandated by CPD policy whenever force is used. Faust did not explicitly say whether Harvard is undertaking its own review of the incident. “What we do know raises important issues about the relationship between police and the communities they serve, student health resources, and the manner in which University units operate with each other and with our partners in the community,” she wrote. In its statement Saturday evening, BLSA called the incident “a brutal instance of police violence.” Students gathered across campus Saturday and Sunday to discuss the incident and plan a response. Faust wrote that she and other Harvard administrators will work with the City of Cambridge going forward to address the incident. She added that this process will involve consulting students, faculty and staff. “Ultimately, this is about building a community where people from all backgrounds and life experiences can come together confident in their ability to do their best work in a safe, supportive, and constructive environment,” she wrote. 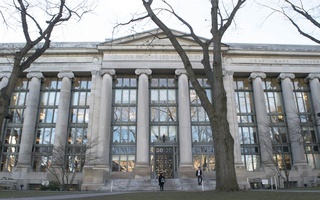 Associate Dean of Students for Diversity and Inclusion Roland S. Davis said Sunday that Harvard’s Office of General Counsel and Massachusetts Hall—traditionally, a reference to the University’s central administration—are “involved” in examining the Friday arrest. Asked about the role of Massachussetts Hall in responding to the incident, University spokesperson Melodie L. Jackson referred reporters to Faust’s email to Harvard affiliates. Later asked about OGC's role in responding to the incident, Jackson provided an emailed statement. “The Office of the General Counsel plays a role in working with institutional leaders to help understand consequential events and to advise on ways that institutional processes might be improved,” Jackson wrote in the statement. Deans at a number of Harvard’s individual schools sent emails to school affiliates following the student’s arrest. Law School Dean John F. Manning ’82 responded to the event in an email Saturday morning, writing that the Law School’s “immediate focus” is to provide support to the community. Like Faust, Manning wrote that though the University is “still learning all the facts,” the incident has invoked a nationwide debate surrounding use of force by police officers. “What occurred last night reminds us again of troubling questions about the relationship between police and the community nationwide—and particularly encounters with members of the Black community,” Manning wrote. At the Graduate School of Education, two administrators—Executive Dean Jack Jennings and Associate Dean for Enrollment and Student Services Maritza Suyapa Hernandez—sent messages to students, faculty, and staff on Monday morning and afternoon, respectively. Hernandez invited students to a community meeting on Tuesday to discuss the incident. She also listed resources that students could utilize if they are in need of support, including HUHS and Counseling and Mental Health Services. Jennings, who co-wrote his message with Academic Dean Nonie K. Lesaux, extended Hernandez’s invitation to faculty and staff. Kennedy School Dean Douglas W. Elmendorf sent an email to HKS affiliates shortly before Faust responded to the arrest on Monday. Like Manning, Elmendorf emphasized that the school wanted to support students who are “distressed” by the arrest. Elmendorf invited students to convene at the school’s Office of Diversity, Inclusion, and Belonging Monday afternoon to reflect on the incident. Twenty-five students attended the meeting, which Robbin Chapman—the Kennedy School’s new diversity dean—co-hosted with Debra E. Isaacson, the associate dean for degree programs and student affairs. Attendees charged that Elmendorf’s message was “unsatisfactory,” highlighting the fact that the email did not identify the victim as black and that Elmendorf sent it two days after the Friday incident, unlike administrators at the Law School and Graduate School of Education. Elmendorf also said he should have sent the email to HKS affiliates on Saturday, rather than waiting until Monday. He explained that he had reached out to central administrators to learn more about the incident over the weekend. 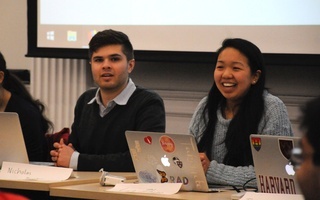 “There were a lot of conversations among administrators about what happened and I didn't actually learn much in that meeting that had not been seen in The Crimson,” he said. 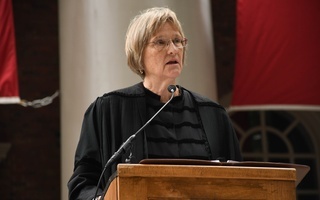 A previous version of this article incorrectly indicated that University spokesperson Melodie L. Jackson responded to a question asking about the Office of General Counsel's involvement by referring to a statement from University President Drew G. Faust. In fact, Jackson responded to that question by providing a separate emailed statement. —Alexandra A. Chaidez contributed reporting.